Master Lock is recognized around the world as the strongest, most enduring name in padlocks and security products. The iconic Tough Under Fire™ shot-lock demonstration showing a Master Lock padlock withstanding the impact of a rifle bullet is jaw-dropping to the millions of viewers who have seen it since its first air date on the Super Bowl. Enjoy these Tough Under Fire™ stories, written by customers like you, about Master Lock’s innovative products, superior strength and proven performance. After over 40 years of service I will have to replace my No.5 Master Lock! I guess the pins are getting so worn I have to play with it for a few minute to get it open. My wife will miss the lion keys. U think a Master Lock isn't strong? Some thieves tried to drill out a lock on a gangbox at work with my tools one night after work. The bit had broke off while they were drilling on it. So when we came to work there was a hole where the key goes! We worked on drilling the lock for two hours and it was still locked. We had to cut a hole in the top of the box and cut the lock off from the inside. What an ordeal that was. But one thing is for certain my tools were still safe. I'm SOLD on MASTER LOCKS. This lock is the best. The simple black lock (or any other Master Lock) simply will not fail you unless you are doing something absolutely ridiculous to try to make it fail. I actually wash my Master Lock in water and it still works fine. A little lubricant makes this lock work just like new. This is a company that clearly cares about it's customers, and it's the only company that I will ever buy my locks from. 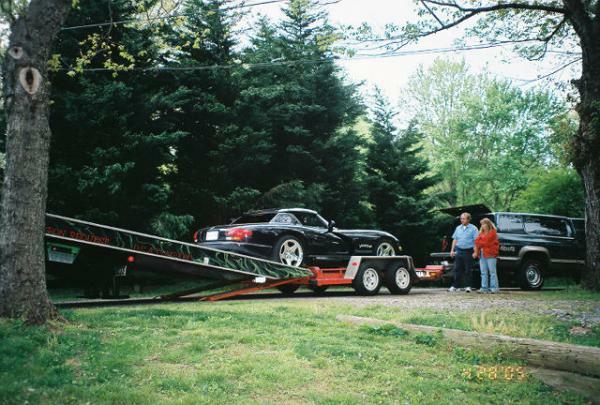 Travelled 1,000 miles with my 2001 Dodge Viper RT/10. I absolutely would not trust leaving my car unattended without the security of a Master Lock Magnum! My Father was old school, born in 1909, and he always used Master Locks. I use them exclusively for various applications and now my Nephew continues the trust our family has with your products. 100 Years of trust is VERY unusual these days! 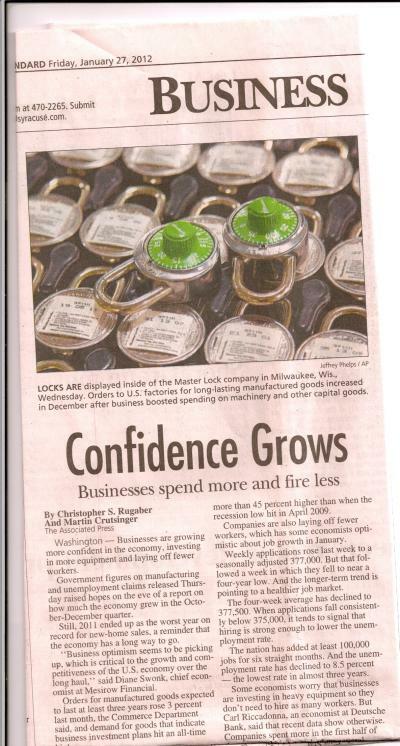 Master Lock's slogan for their padlocks is TOUGH UNDER FIRE! Here is proof! These locks come from the railways and are used to lock up track side boxes. Copper thieves could not open the box, so in frustration tried to burn the padlocks open. Well, the results are fantastic, the Master locks ARE tough under fire - these locks still operate after being torched! I run a paintball field, and we recently got a shipping container to store equipment in. I was worried about the possibility of someone cutting the lock. So i purchased a Master Lock 40DPF since it had a short hasp that would making cutting difficult. Little did I know a month after getting the container the lock would be put to the test. I showed up at the field one evening to find several .308 shells laying around. When I checked the lock, it had been shot point blank. Almost all the internal components were gone, but the lock was still locked. It took me about 30 swings with a sledge hammer to finally remove it. That lock save me about $5000 worth of equipment from being stolen. I will never trust another lock company but master lock. I arrived at work Friday morning to see where a vehicle had demolished our front gate. The only thing holding our gate together was our Master Lock # 5. The recent newspaper article prompted me to relate my experience. Before leaving for Vietnam in 1964, I was issued a Master Lock by the USMC. This lock has been through "hell" (2 years in combat in the jungle) and for the past 20 or so years has secured my tool shed, being constantly subjected to the outdoor elements. It has outlasted at least a dozen cheaper locks and still works well. How can you folks survive by making a product that just doesn't quit working? This one will outlast me!! I promise you that I will never buy another lock unless it has your name on it. Thank you. The decks were stacked against our Master M5EURD EXCELL padlock the other day when at 5 AM, the security cameras picked up a team of five baddies descending on Borehams Kyalami Liquor Store in Gauteng, South Africa. The team carried a mean looking bolt cutter which made mince-meat of a competitors brass lock. 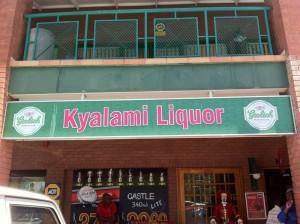 Luckily, the smart owner of Borehams Kyalami Liquor Store had also secured his premises with another lock. Our Master M5EURD EXCELL padlock, stood alone between the five baddies and the liquor and cash within the store. The baddies were obviously a well practiced team : when the M5EURD did not flinch under an attack from the bolt cutter wielded by one baddie, the team split themselves up. One supervising baddie and two baddies on each side of the powerful bolt cutters. The security cameras recorded a team effort of over ten minutes as the team struggled to shear the Master M5EURD EXCELL padlock. They gave up, leaving our champion Master M5EURD padlock battered but not broken. The picture clearly shows the Master M5EURD EXCELL padlock with the marks on the shackle where the bolt cutter was unsuccessful. I have 7 Master Locks all 175DLH on the gates to our property. 2 failed and your company is extending the lifetime warranty to me. THANK YOU!!! 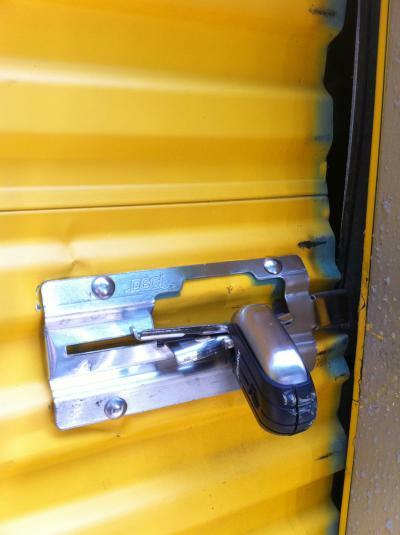 There was a major break in at my Storage unit location...30 Storage units were broken into when the locks on the units were cut with a bolt cutter. But my unit with my Master Lock held up and the robbers could not break my lock or get into my storage unit, although they did mess up the door and latch trying! I used the No 187XD Shrouded Padlock...Thanks Master Lock for such a great lock ! I am working on a project converting ISO Shipping Containers into living space on a remote area outside of 29 Palms,CA. I have the containers secured with various models of your locks. A couple weeks ago some person(s)decided to break into my containers. Your brass combo lock was cut in one attempt & your warded padlock was opened by prying (those locks were being used for the wrong application anyway) BUT!!! - your disc shaped Magnum Lock hung on incredibly well. Those dirtbags attempted to cut the lock with bolt cutters, beat it with a crowbar & shot it with a 357 magnum (shell casing left at the scene). As I write this,I have that lock sitting on my desk with part of the shipping container door still attached to it!!! It was so hard to open the lock that they cut the container open around it. I'm upset that I was burglarized, but smiling at the same time as I picture these fools beating on this lock till blue in the face only to have to start over with plan B. I would have paid to watch them in the middle of the California desert (115 degree heat) beating on that lock! Thanks for letting me share my story. Back in 1975, when my mom went to Cajon High School, she used a Master No. 3 padlock for her locker. She used this padlock for three years, and on grad day, locked it to the fence behind the gym. Well what do you know, 33 years later I find myself at her old school, and her padlock is STILL there, battered and rusty, but still holding strong! My mom even kept the old key and decided to let me try it. 33 years of weather, vandals, custodians with bolt cutters and rust just had no effect on this lock, it popped right open! What's more, I continued to use her old padlock throughout my years at Cajon High and it NEVER let me down. I still have it now! Master sure got it right with their laminated padlocks. For school we needed a gym locker lock and I had the one where you reset the lock by moving the wheels on the red markers. At the end of the year my gym teacher said "If you don't take your locks home, we will cut them off and take what's inside the locker." Unfortunately for them, I had a Master Lock and they couldn't cut it off with bolt cutters! So they had to call me over to the school to remove the lock. On Saturday March 13th my home was hit with a devastating storm. The winds just south of us were clocked at 75 mph which knocked down a HUGE pine tree in my back yard. Unfortunately it fell down directly on my shed making it resemble a taco. With my 1986 Harley Davidson in the shed I immediately ran to the shed to look inside. Miraculously the bike was fine. As I walked around the shed to assess the damage I was so proud to see my Master Lock still holding tight in the hasp with the entire shed collapsed, and a 5,000 pound tree on top. These are the only locks I would ever use. Thank you for making a great product. I live on a Lake and own a boat shed for my equipment worth large amounts of money. I had a Master Lock Pro Series 6321 High Security Padlock on the door, and it prevented two attempts at burglary. Thank you Master Lock! Today I visited the Gold's Gym. I had been leaving my stuff in one of the lockers and secured it with a hardened Master Lock combination lock. When about to leave I noticed 2 bolt cutter marks where someone tried to cut the lock in half but without success. Apparently you weren't supposed to leave the lock on over night. Now I know and my lock is still as good as new. They couldn't cut thru it. Amazing lock. My hat's off to Master Lock. I live in San Francisco where bike theft seems to be a popular sport. I am on my third bike now after the first two were stolen. I went from a cheap cable lock (which was broken off) to a no-name brand U-lock from Walmart (which was broken off) to a heavy duty Master Lock U-lock. Yesterday, I went into Safeway for only twenty minutes - to buy and eat a sandwich for lunch. When I came out, to my surprise, I went to unlock my bike and found my lock looking kind of strange. At first I thought, maybe this isn't my bike, a bit dumbfounded. Then I realized it was my bike and the lock was completely bent out of shape - a thief had tried to use a carjack to pop it off! Lucky for me - Master Lock won! The thief lost. The bike was not stolen and, although the lock had to be cutoff because it was damaged beyond use, it did its job - thwarting the theft of a $450 investment and my only form of transportation - my bicycle. THANK YOU MASTER LOCK - Your product worked wonders. I lost the key to my Master Lock padlock keeping my flagpole lowering mechanism locked. I decided that I would go down to my local hardware store and borrow their bolt cutters. I BROKE THEIR BOLT CUTTERS trying to cut the lock! Haha! Talk about one tough lock! I was issued a long shackled Master Lock at the Coast Guard boot camp on Jan. 12, 1960 which was used for my seabag. I remained in the Coast Guard until Feb. 1980. The lock traveled all over the world with me and it is still being used on barn doors today. My husband and I have used your brass combination locks for many years. Most recently, we had one on a metal shed that was located in our back yard. The shed was burglarized not only once but twice within one week! Although the burglars ultimately managed to enter the shed by using a crow bar to pry off the hasp, the lock fared in much better shape! I was very impressed at the inability of the burglars to pry, cut, or in any way break the lock! Fantastic product that we will recommend to anyone! I recently bought a Master Lock Laminated Steel padlock due to the recent locker break ins at school, where some combination locks were broken with some kind of blunt object. I thought it would never happen to me but Thank God I had a Master Lock on my locker! They tried to smash it open with what looks like a hammer or some sort of other object. Four other lockers got broken into and stuff was stolen, but mine was the only lock that stood strong! I recently purchased your "Street Cuffs" for use on my motorcycle and when I parked my bike and put on the Cuffs I felt confident in them. When I came back to my bike the motorcycle was in pieces but guess what? The Street Cuffs were still holding on tightly........thanks to MASTER LOCK!!! I purchased a Master Lock (combination) in November 1982. I have used it 5 days a week for my fitness center locker (opening and closing it thousands of times). Today it broke...sad day. I immediately (after my gym workout) bought another one. It's kinda fancy but I miss my old one :-(. You guys have too good of a product. I'd like to tell you what is left of a bicycle after the owner attached it to a telephone pole guy wire. It has been stripped of handle bars, seat, pedals, and almost everything else, but the frame is still there because of the Master Lock U-Lock. Location: Westheimer & Fountain View, in front of the HEB store. 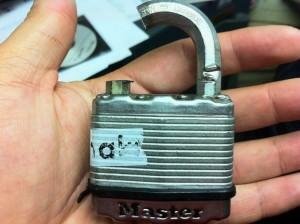 I have a Master combination lock and I used this lock to secure my gym locker at school because I'm always in sports. During wrestling practice it was apparent that someone had tried to break into my locker. It had some major dents from trying to be hit and pried open. This lock saved me from having to buy another Zune and phone. Thank you, Master Lock. As a distributor of hundreds of thousands of products, I have many security options to choose from. I'm also a mechanical engineer, so I have a certain appreciation for design, strength and quality. After reviewing the options available, I chose a Master Lock Pro Series #6121 to secure a storage building that I was renting. This choice was not an easy one to make, as the storage building was in a remote location, the lock would be exposed to the elements, and reliable security was paramount. Many manufacturers had fancy colors, claims of performance or high price tags. While not the least expensive option, I felt the model #6121 fit my needs, so I bought one. On a recent visit to the storage building, I was surprised to find out that someone had attempted to break into the building by cutting the lock. Instead of panicking about what had been lost, I instead found myself laughing at how frustrated the would-be-thief must have been when they couldn't cut the lock. They probably broke their bolt cutters, because all that happened to the lock is that there are small "dings" where the cutter was engaged on the shackle. Many people buy insurance hoping they'll never need to use it. In some ways, my purchase of the #6121 was similar. Your product exceeded my expectations in that it truly prevented loss of my property. While I "hoped" my property wouldn't be stolen, your lock "made sure" it wasn't. I bought my first Master Lock combination in 1980 for high school. For some reason the number stuck in my head and I never forgot it. It went to college next and then sat for years packed away. Now 29 years later it is used at work for my locker. I always see the new colors in the store and want to buy them, but I am true to my original black and silver that still works! I just want to say "Thank you" to Master Lock! Many years ago, as a new police officer, I purchased a combination lock to secure my belongings...now, almost 34 years later, the lock works as well as it did when I bought it! Perhaps your workmanship is too good because I have never had to purchase another lock! It is truly a "lifetime" lock!!! I live in an apartment with a storage bin. I store my carpet cleaning machines in the bin. One day I went to get the machines to do a job. I went to open the lock and noticed that someone had drilled into the keyhole. Well I could not open the lock. But what amazed me is that I could not cut off the lock with bolt cutters! So I went out and purchased another Master Lock. I'm letting you know how Master Lock saved my belongings. THANK YOU!!! Dirk T.
I have 2 Master Locks. One for my band locker that keeps people from stealing my trumpet and one for my regular locker. I have caught 2 people trying to break open into my regular locker and 3 people at my band locker. They all are notorious for breaking into other people's lockers but they just could not break into mine. I guess they're called "Master" Locks for a reason. Your Master Lock door security bar is the ONLY thing that stopped a criminal from entering my hotel room through a sliding glass door in Lucea, Jamaica, on 11/16/08. I am wife and mother of two young children who was alone when I was startled awake by a loud "pop." It was the final force my would-be attacker applied to the door after successfully disengaging the door locks while I slept. The door was only a matter of feet from of my bed. It was only because of the strong security bar that the door jammed and did not open and the perpetrator fled. Thanks to you, I was spared a horrific, and very possibly deadly, experience. It is the wisest $18.95 I have ever spent, and I will never again travel without it. THANK YOU for making a product that delivered the protection you promised when I needed it most. Because of you, I returned safely to my family and wonderful life. I am grateful beyond words. Over 35 years ago, I was attending high school and obtained a lock for my gym locker - a simple black-faced Master Lock Combination Lock. I used the lock for years. As a three-sport athlete, it was used for football, wrestling and baseball. After graduation, I took it with me to college. The lock was exposed during walking in all types of weather and it worked. Amazingly, in 1992 I required a lock to secure a gym bag, and since then have used that lock for the same purpose - thus the elements have not destroyed the lock's intended use. I am amazed that for more than 35 years the lock has never failed me. You should truly be proud of the fact that a product intended for a specific purpose far exceeded that purpose and is still functioning. Gentlemen, I wish to say thanks for saving my ATV from being stolen from a 8ft x 20ft cargo container stored at my hunt club. The lock was shot but it held so the container couldn't be opened. They tried to open it sometime between Sat.evening and Sunday before 2:00 pm. Thanks Again. Three years ago I purchased a landscaping trailer for my business. I knew in advance that these trailers were high theft in the Detroit area. I purchased a hitch lock (not a Master Lock product) as recommended by the trailer manufacturer, yet I was still unsure of the safety of my trailer in public storage. One day after my purchase I was looking at some Master Locks in a store (Pythons in particular) and decided to purchase two of them. One evening a partner of mine called me late at night to tell me that there was a problem with my trailer and to come down to look. 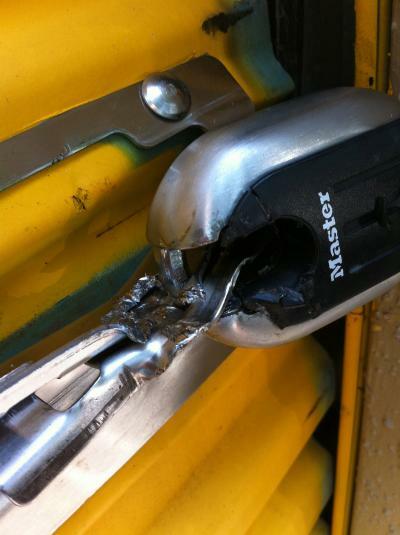 Once there it was obvious that some dirtbag had defeated the hitch lock (not a Master Lock product) on the trailer. However, the Pythons were able to withstand the punishment and thereby prevented the theft of my trailer!!! Thank you Master Lock for such a reliable product. Martin P.
I have Master Lock (model 175) padlocks on all the gates and equipment sheds on my farm. I found that someone had cut a chain gate and tried to break in to the equipment shed. It looks like they tried to pry, cut,and hammer the Master Lock off the door but where unsuccessful. The shackle bent out of shape but did not open. They finally gave up. TOUGH UNDER FIRE, I have to say this Lock Co. is the best in the World. I use Master Locks for my every need. Just recently someone had tried to break into my work shed and they unsuccessfully used bolt cutters to cut the Master Lock. I use the 4 pack for the convenience of one key and this lock saved me THOUSANDS OF $$ in losses. It also cost the thieves a bolt cutter as I later found a piece of the cutters jaw! The Master Lock with hardened shackle is the boss in my book of the Worlds Best. Thank You Master Lock, for making me safe. I am glad I had a Master Trailer Coupler Lock on my 16 foot trailer. It appears that some miscreant repeatedly tried to compromise the lock with a screwdriver and hammer. The lock held and the trailer is safe. The lock is now difficult to unlock and will need to be replaced. Someone tried to break in my locker while I was at a gym today. But the thief could not break my Master Lock combination padlock. Even though the padlock had been damaged heavily, it saved my stuff, including my wallet and keys, from the bad guy. I thank Master Lock for making such a tough padlock! We had a warded Tough Under Fire steel laminated padlock (No. 22) that we've used up at our camp. Over the years it has gotten burnt, rusted, and frozen but it held up great and still works fine. I got a Master Lock model 527D for my gate last year. On the lock you could see someone tried to break in, but they could not. Thanks to Master Lock my yard is safe. My family rides ATV's. We have three of them. We were recently on a 3 day out of state trip with our machines and had them secured to the trailer with chains, cables, and Master Locks. We aren't exactly sure if it happened during the nite, while we were sleeping, or during the day while at a racing event as spectators, but someone attempted stealing our machines! They were working on 2 of the 5 locks with bolt cutters and prybars, but were unable to get them opened. We were very surprised and disturbed that someone tried to take our machines, but very pleased that our decision to use Master Locks saved them. The locks really stood up to the would-be thieves' attempts. THANK YOU for a great product! Sincerely, Frozen Lake Racing, Mazomanie, WI. 53560. In 1980, I lived in Paris, France on 'Boulevard de Maleherbes, in the 8th Arrondissement'... Across the street is the entrance to a park with a huge iron gate entrance (Parc Monceau). I used a long combo lock to attach my old BMW motorcycle. Someone had unsuccessfully tried to steal my bike and made the lock inoperable. When i moved elsewhere, the same year, i left the lock attached to the park entrance gate. The gate has been repainted several times since. The lock is still there... 27 years later. I consider this lock as a family heirloom. Each time i visit Paris with my family, we make it a point to pay respects to our lock! Lost in the woods of Minnesota for 17 years, the lock had endured snow, rain, heat of summer. Still, a little oil and it works smooth as can be. I couldn't believe it, yet it has gone on to an "new life" keeping our bikes secure. What a lock. I got to work the other morning and my boss was not there. He had the keys. He called me and told me to drill the lock. I now have a #5 Master Lock with a 3/4" hole in it - it never did come unlocked! I drilled all the way through the lock and into the hook on the job box (like a knack box watchman III system). That was Tuesday. This is Saturday. My wrist still hurts from running that drill. Oh yeah it took three hours to get into the job box! I purchased a Master Lock Door Bar (model 265) approximately ten (10) years ago. Since I travel a lot, I use it extensively for home security. On May 2, 2007; at approximately 7:10pm, a car lost control and collided with the corner of my front porch. This is an enclosed front porch that is part of the original structure (built around 1920). The impact pushed the wall and door frame across the front of the door, breaking the outside knob and causing quite a bit of damage. Your product was in place for security at the time of the impact. While looking at the damage, I noticed that the Door Bar was still in place, holding the front door closed. As a result of impact damage, even though the front door was pushed inward, the bar held its ground, caving in a portion of the porch floor. The bar is undamaged and still in use!!!! Thanks for such a great product!!!!! My wife and I recently moved. We packed all of our belongings into a moving truck, and I locked it with a Master Lock No.5 lock that I purchased about 10 years ago to lock a storage shed. During our trip we stopped for the night, and the next morning I found that someone had tried to break into the truck. They apparently tried to use bolt cutters to cut through the shackle. I don't know how long they spent working at it, but judging from the number of scratches on the shackle they must have spent some considerable effort. As you can probably guess, the amount of progress they made was pathetic. They would have been better off trying to cut a hole in the side of the truck. Our belongings were safe, and the lock is still in good enough condition to use the next time we move. Thanks for building a quality product. I have a Master padlock that my Grandfather gave me. He told me a story about how during the Depression his father went out and bought this lock to stop a thief from stealing gas from his garage. He told me that he took the lock out of service in 2000 when his Mom passed away. 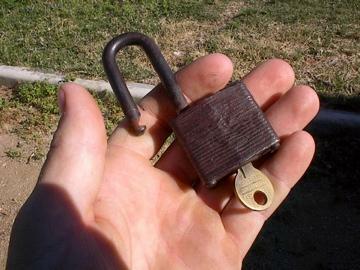 If you ask me a lock that still works after being used for about seventy years is one lock that is Tough Under Fire. I have the lock and an original key. I have a Master Lock U-Lock Bicycle Lock and recently went out to my bike to go ride to work and I found a broken car jack next to the lock. The lock was bent but not broken. Thanks to Master Lock I still have my bike. When I went to go unlock my bike the lock still works but the 2,000 pound car jack is broken. Thanks Master Lock. Just wanted you to know that while operating in a convoy in downtown Baghdad my vehicle was hit by an improvised explosive device blowing out my two rear tires. I pulled up to the next vehicle, jumped out to hook up our tow chain, and realized that our chain only had one hook. I should have known this, but in order to get myself and my soldiers out of the "kill zone" while being fired upon by insurgents I used a Master Lock to secure my chain to the vehicle ahead of us. Your lock was so tough that it pulled a broken up-armored M1114 military vehicle 4 miles to the nearest base for repair. Thank you for manufacturing such a quality product.